I know, right? This looks like the plate of fries you order, put in the middle of the table, and share among four friends. But, there is something very special about these. First of all they aren’t fried. Secondly, they aren’t potatoes! It must be true because, for a couple of years, now, we have scattered seeds randomly in our gardens and the turnips have been very prolific. 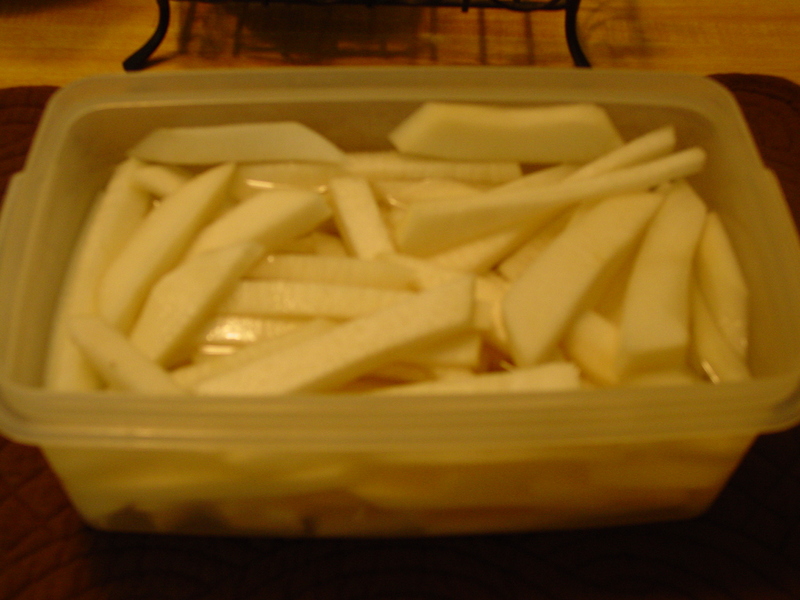 And it just takes a couple of these babies to make a batch of turnip fries. I happened upon this idea one day when I had harvested several turnips, washed and peeled the veggies, and we had to leave before I had time to cook them. I decided to slice them up like this to store them in the refrigerator more easily. And after seeing roasted sweet potato fries, I thought, why not? These sat in the refrigerator for a day or so, and I drained, rinsed, and patted dry. Then I lined my favorite old cookie sheet with foil, drizzled a bit of olive oil onto the foil and swirled it around with my fingers. 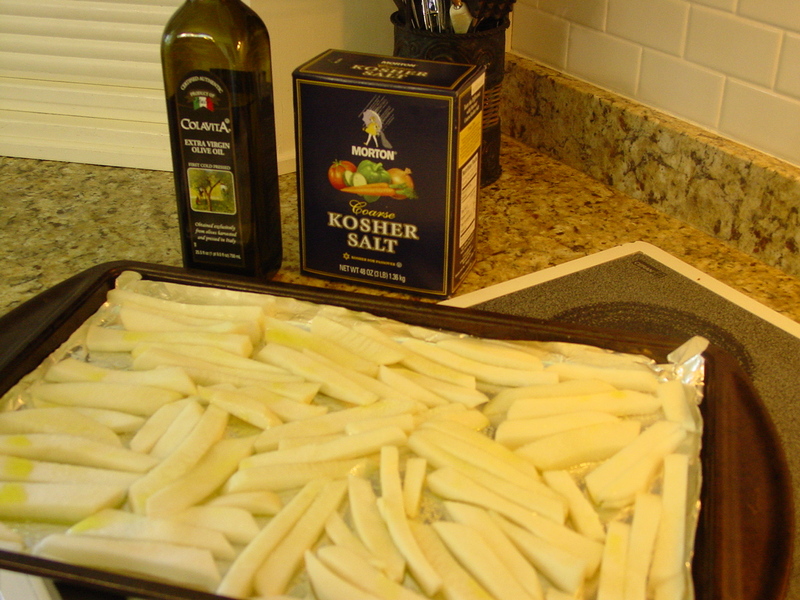 Next, I added a single layer of turnip slices, drizzled a bit more olive oil over the top…not too much, now, and tossed the “fries” to distribute the oil evenly. I sprinkled them generously with kosher salt and placed them in a 470 degree preheated oven (next to top rack) and let them cook until the bottom sides started to brown. The time for this will vary according to your oven, but it took about 10 minutes for mine. With long handled tongs, I turned the fries and cooked an additional 8 to 10 minutes, allowing them to caramelize a bit on top. I removed them to a paper towel to drain, and Wow! Yep! I ate the whole thing. And I don’t even have to feel guilty about it. Very healthy and low carb! 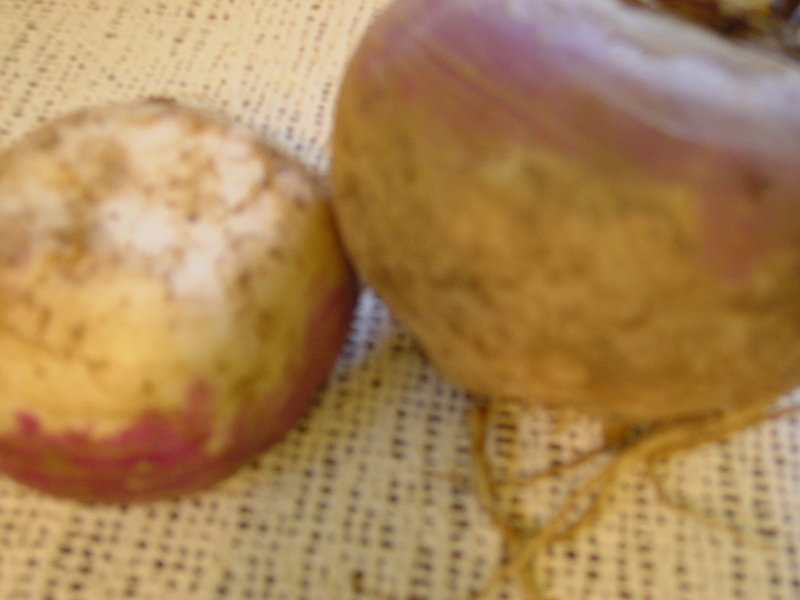 If you are a turnip lover, this is like icing on a cake. If not, try these. You might just become one of us! 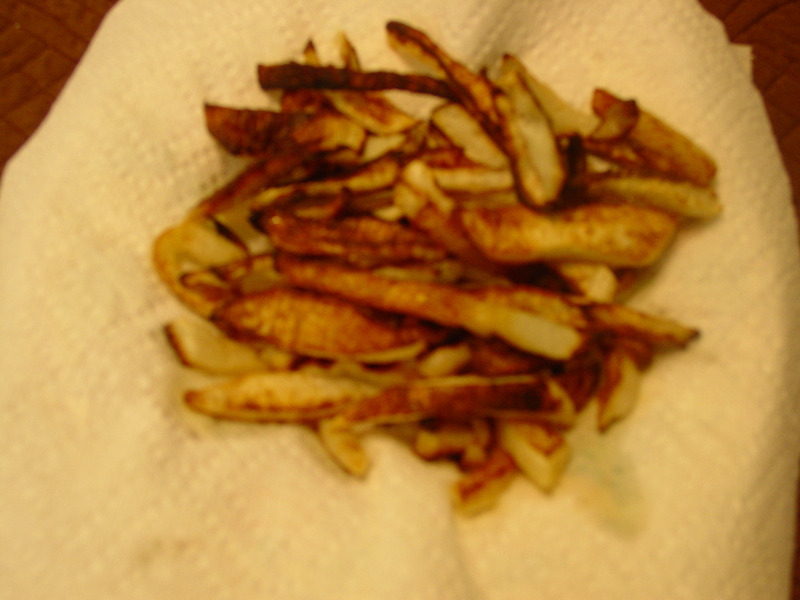 If you dry them well with a paper towel, they will crisp up better. Any extra moisture tends to make them steam. When they look like they are browned, leave them a bit longer. That carmelization assures more flavor. I added more salt after they were cooked. I like salt. Try adding some fresh rosemary leaves or maybe some garlic cloves while cooking. You may have noticed that I likelove am obsessed with making over old pieces and turning them into something else. I’m not great at it, but, occasionally, something turns out really nice.Remember the antique bed that I purchased for $7.00? I made the little snowmen out of the bedposts and already sold them in my flea market booth for $14.00-I know, they were worth $50 $35 a lot more, but I sell everything cheap so I have room for more. Then I made the coat rack that I just love and put in my booth last week. 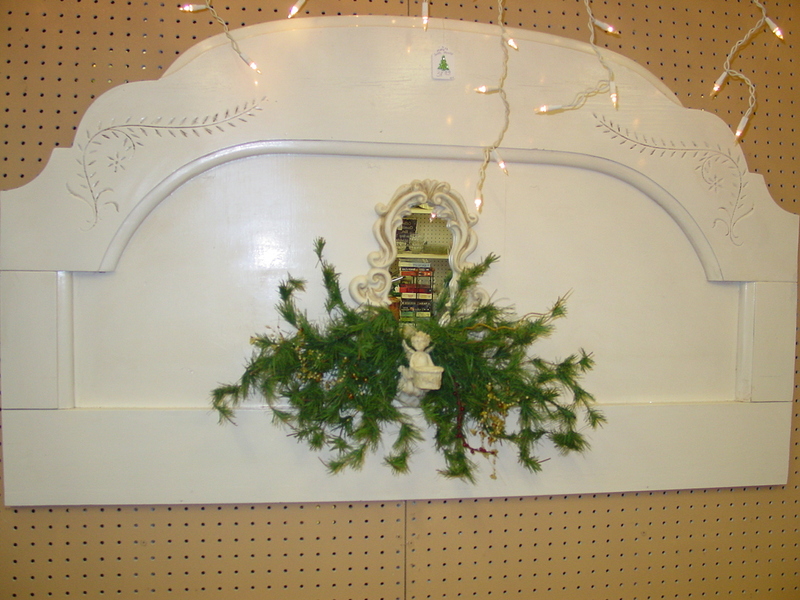 Here is a picture of the headboard turned Christmas mantel piece that I also made from that same $7.00 purchase. I really wish I could have kept it and used it in my home. Oh, well…when I get that lake house! I still have a couple of bedposts left that I have plans for and some other Christmas upcycles to show you later, but I found this article on Houzz that really touched me, and I wanted to share it with you. Reclaimed furniture and reclaimed lives. What an inspiration. Enjoy!